I believe the best way to connect with an audience is through creating original, engaging content. I have managed social media channels including Facebook, Twitter, Flickr, Instagram, and Tumblr. I have also written weekly blog posts for several companies in order to increase their digital presence. 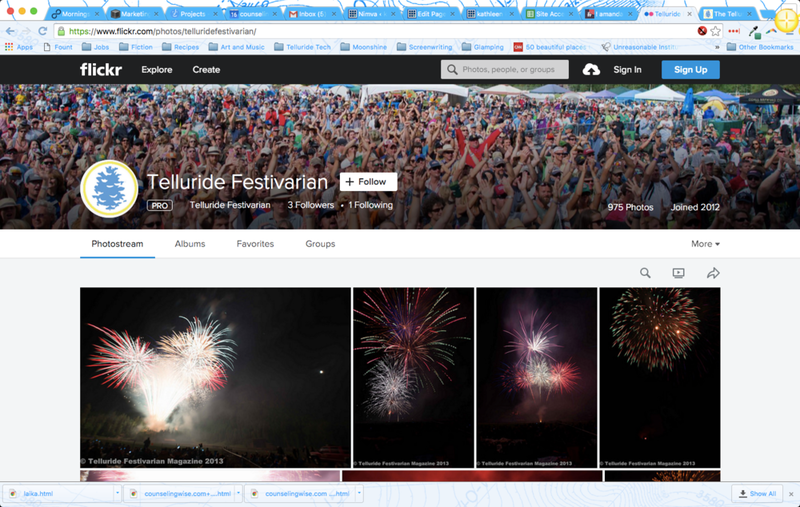 I managed the social media presence of Telluride Festivarian. We focused on Facebook, Twitter, and Flickr because our local audience connected with those channels most. Management was done mostly manually, but using some integrations between Facebook & Twitter, as well as Lightroom, Facebook, and Flickr. Blog was hosted on WordPress. When I joined Boulder Magazine, their Facebook and Twitter accounts often fell to the wayside as other projects took up the editorial team's time. I implemented weekly blogging on their WordPress site, inventing the weekly "Shortlist," which covers activities around the county for the weekend. The magazine still utilizes the Shortlist format to draw traffic to the site. Additionally, I managed posting events, blogs, and news to their social media channels through HootSuite. After 5 months of social media management for Boulder Magazine, traffic to the website increased by 400%; the site started ranking 1st for "Boulder Magazine" locally (up from 3rd place), and we began getting enough traffic on our channels to start selling 3rd party ads on our site. In addition to larger management projects, I've written weekly home and gardening tips for the blog at Boulder County Home & Garden Magazine, and I've enjoyed writing freelance. I have an extensive writing portfolio also on this site. Much of my freelance work is journalism for print or digital. For example, I wrote "How to Ski Colorado On A Budget" for 5280 Online in January of 2016.